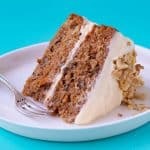 A soft and moist Carrot Cake with maple cream cheese frosting. Preheat oven to 180 C (360 F). Grease and line two 8-inch cake tins with parchment or baking paper. In a large mixing bowl, add flour, sugars, baking powder, baking soda, cinnamon and nutmeg. In a separate bowl, add oil, vanilla, eggs and milk and whisk gently, just to break up the egg yolks. Add carrot and nuts to dry ingredients, along with the wet ingredients, and mix gently until combined. Pour into prepared cake tins. Bake for approximately 30-35 minutes or until a skewer inserted in the middle comes out clean. Gently remove cakes from cake pans and leave on a wire rack to cool completely. To make the frosting, add the cream cheese and sugar to a mixing bowl and beat with an electric mixer on medium speed until combined and smooth. Add maple syrup and beat again. Spread one third of the frosting onto one of the cake layers. Add the other cake on top. Add remaining frosting on top. Sprinkle over chopped nuts. Cut and serve. Approximately three medium-sized carrots. You can leave the skin on the carrots before grating.